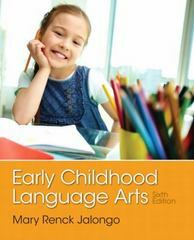 Early Childhood Language Arts 6 Edition “What do early childhood educators really need to know, do, and understand in order to work effectively and compassionately with the very young?” This is the focus of Mary Renck Jalongo’s approach to this new edition of her widely popular Early Childhood Language Arts. In it she helps teachers become well informed about young children’s language development, strategies to use to support language growth, and the essential elements for a novice teacher to mature into a master teacher. Distinctive from many other early literacy books in that it includes oral language rather than concentrating on literacy in print, the approach is to integrate language arts and other subject areas, including the fine arts.